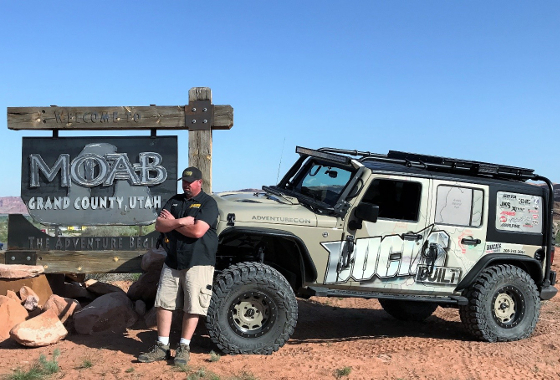 Dallas, TX -- May 1, 2017 -- ARIES Automotive, a fast-paced marketer and innovator of truck, Jeep, SUV and CUV accessories, joined Alpha Jeep, Buck's 4x4 and other Jeepers on the plains of Utah for the most epic trail rides of the year at the Easter Jeep Safari 2017. Off-roading has always been the ultimate adventure for people who like to combine their love of the outdoors with the love of motorsports. 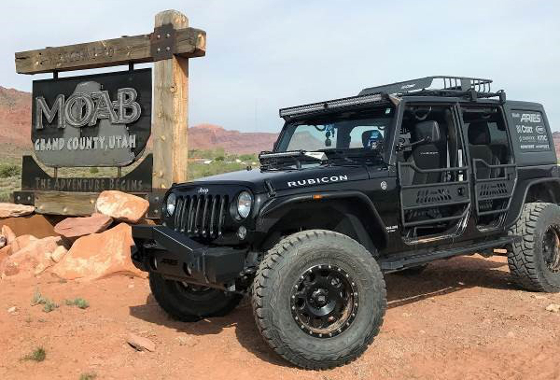 Featuring off-road vehicles in all shapes and sizes, from bone stock to purpose-built rock hoppers, the Easter Jeep Safari in Moab, UT has been a mecca for the Jeeping community since its inception in 1967. This nine-day event features trail-riding and wall-crawling adventures for families, enthusiasts and the businesses who are there to trail-test their products. 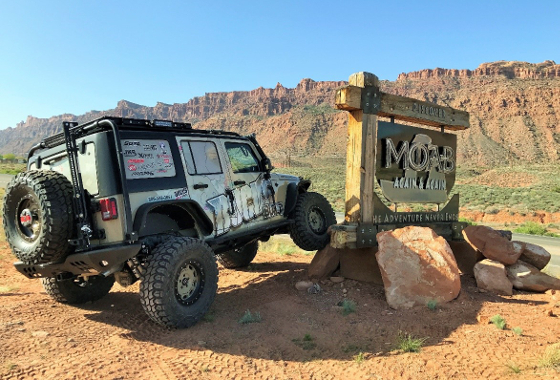 Hosted by Red Rock 4-Wheelers, EJS 2017 featured a variety of trail riding experiences on trails with affectionate names like Steel Bender, Hell's Revenge, Deadman's Point and Rusty Nail. For 2017, ARIES Automotive products were in full force on three full Jeep builds. 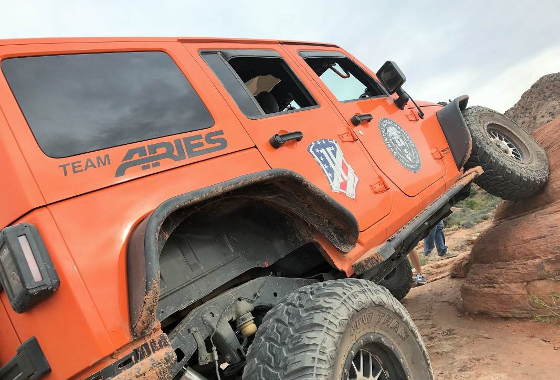 Team ARIES Pro Builders Alpha Jeep's 'Alpha Crush' and Buck's 4x4's 'AdventureCON' were both in action and fully trail-ready along with our own 2015 Jeep Unlimited Rubicon we nicknamed 'Sandtrap'. 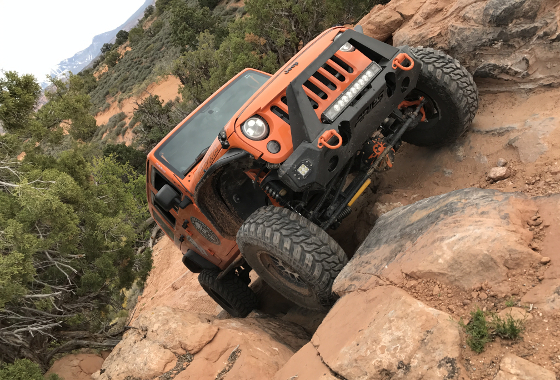 Featuring our full array of products including ARIES steel and aluminum TrailChaser™ bumpers and our all-new, one-piece steel TrailCrusher™ bumpers, we took on Steel Bender, Hell's Revenge and the Skyjacker Suspension sponsored trail ride White Wash Dunes. This unique trail features a dizzying array of terrains from super sandy dunes, muddy canyon trails, packed washboard roads and plenty of gnarly rock features. Click here to see a video of Team ARIES at the Easter Jeep Safari or to become an ARIES dealer. For more information on how to join Team ARIES Pro Builder Program, please contact [email protected]. About ARIES Automotive: ARIES is a fast-paced marketer and innovator of truck, Jeep, SUV and CUV accessories. We specialize in custom-fit grille guards, bull bars, side bars, running boards and interior floor liners, as well as Jeep-specific accessories, such our modular Jeep bumpers. ARIES accessories are made vehicle-specific and are available for most makes and models of trucks, Jeeps, SUVs and CUVs sold in North America. We operate out of five regional warehouses throughout the U.S. and Canada, and our products are marketed through retailers, distributors, installers and eTailers across North America.